The leader of Greek left-wing party Syriza says an end to "national humiliation" is near, as opinion polls put the party ahead three days before the general election. 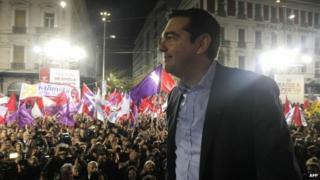 Alexis Tsipras asked supporters for a clear mandate to enable him to end the country's austerity policies. He repeated his promise to have half of Greece's international debt written off when the current bailout deal ends. Greece has endured deep budget cuts tied to the massive bailout. Sunday's election is being closely watched by financial markets which fear that a Syriza victory could lead Greece to default on its debt and exit from the euro. "On Monday, national humiliation will be over. We will finish with orders from abroad," Mr Tsipras told thousands of cheering supporters at the party's final election rally in Athens. "We are asking for a first chance for Syriza. It might be the last chance for Greece." The BBC's Mark Lowen says many Greeks are prepared to give Mr Tsipras a chance, believing life cannot get any worse. Greece has gone through a deep recession and still has a quarter of its workforce unemployed. However, there have been warnings that a Syriza victory could lead to a dangerous confrontation with other eurozone countries. Syriza is tipped to win but without an outright majority, and analysts say the party may struggle to find a coalition partner. Mr Tsipras has said he will not govern with those who support what he has called the policies of German Chancellor Angela Merkel. Under those terms, the EU, International Monetary Fund and European Central Bank - the so-called troika - supported Greece with the promise of €240bn (£188bn) in return for budget cuts and economic reforms. Latest polls show Syriza widening its lead over Prime Minister Antonis Samaras's centre-right New Democracy party. A poll to be published on Friday by Metron Analysis put Syriza's lead over New Democracy up to 5.3 percentage points from 4.6 points. Another poll, by Rass, had Syriza 4.8 points in the lead. Mr Samaras will hold his final election rally on Friday as both sides make a final push to win over undecided voters. Will you be voting in the elections? Email haveyoursay@bbc.co.uk. If you are willing to be contacted by a BBC journalist, please leave a telephone number. Greek elections: What now for the euro?